For other uses, see Tacitus (disambiguation). Publius (or Gaius) Cornelius Tacitus (ca. 56 – ca. 117) was a senator and a historian of the Roman Empire. 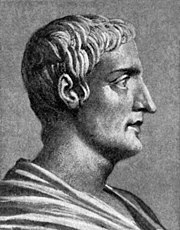 The surviving parts of his two major works—the Annals and the Histories—report about the reigns of the Roman Emperors Tiberius, Claudius, Nero, Galba, Otho, Vitellius, and Vespasian. Syme, Ronald. Tacitus, Volumes 1 and 2. (Oxford: Oxford University Press, 1958) (reprinted in 1985 by the same publisher, with the ISBN 0-19-814327-3) is the definitive study of his life and works. Talbert, R.J.A. "Tacitus and the Senatus Consultum de Cn. Pisone patre". The American Journal of Philology, Vol. 120, No. 1 (1999), pp. 89–97. Wikimedia Commons has media related to Gaius Cornelius Tacitus. This page was last changed on 12 October 2018, at 23:43.